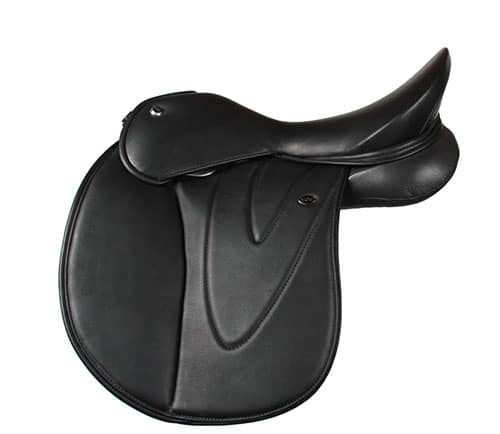 Description – The General Purpose Moveable Block flap is truly a multi-discipline flap with the ability to position the knee block for dressage or for proper jumping. The GP flap is as forward cut as the Jumping flap but on the back edge it is as straight as the Dressage flap but 5cm shorter. It is an excellent choice for young horses or eventers that do not wish to change flaps. Description – General Purpose Fixed Block flap has a very positive knee block for jumping. The GP flap is as forward cut as the Jumping flap. At the back edge of the flap it is as straight as the Dressage flap but is 5cm shorter. It is an excellent choice for hunters or eventers that do not wish to change flaps. Description – Traditional looking Hunting flap with a small removable block located under the very soft padded knee roll. Available with smooth, Pig print or heavily or oiled memel finished leather. Comes standard with short traditional girth billets for under flap girth fastening but longer dressage billets are available.